Heat oven to 350°F. Grease cookie sheets with shortening or cooking spray. In large bowl, beat sugars and shortening with electric mixer on medium speed, scraping bowl occasionally, until well blended. Beat in vanilla and egg. On low speed, beat in flour, instant coffee, baking powder, salt, cinnamon and 1 cup nuts until dough forms. Shape dough by tablespoonfuls into balls. Place 2 inches apart on cookie sheets. Bake 12 to 15 minutes or until golden brown. Immediately top each cookie with 1 chocolate star. Remove from cookie sheets to cooling rack; cool 5 minutes (chocolate will soften). 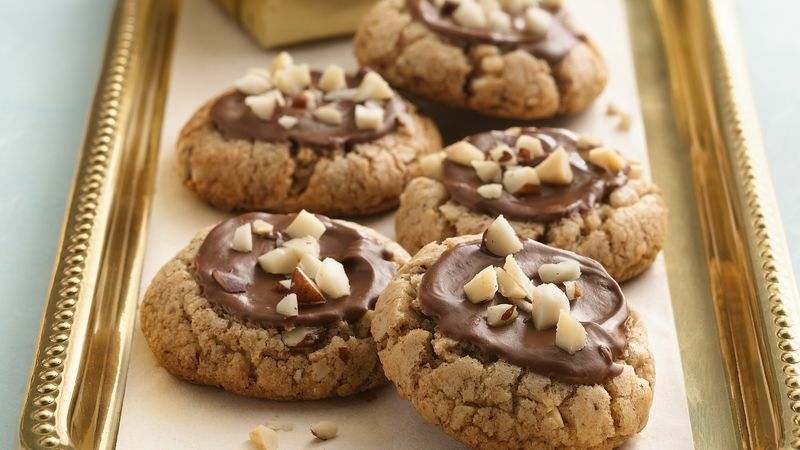 Spread chocolate over cookies to frost. Sprinkle with additional chopped nuts. In place of the Brazil nuts, try almonds, pecans or macadamia nuts. To prevent Brazil nuts from becoming rancid, store them in the fridge.